Couple of months back, it occurred to me that while in a world of WhatsApp and Twitter, Urdu poetry has come into vogue after being vaguely dormant for a long time. Owing to the wit, the wisdom and snappy style, while it has grabbed the attention of the millennial child, but it still lacks the affection it got in pre-90's days. The tragedy of any language is to link it to a religious faith and elevate it with puritanical elitism to such a level, where it becomes obsolete. A language is like a lovely butterfly, which needs to play, dance, float and fly in an open garden. Once it gets appropriated by elite, it loses its gait, its charm and eventually its life. This happened to Sanskrit, to Persian and seemingly Urdu faces the same challenge. Although this is not a singular plight of Urdu as a language, in a world of emoji, all classical languages bear the brunt of too much of technology and too little of time. कोई हमें बतलाये के हम बतलायें क्या।"
While the root of this question could be in the national boundaries re-drawn between India, Pakistan and Bangladesh when British left India,to lose an intellectual giant like Mirza Ghalib in the dusty by-lanes of narrow nationalism is saddening. We can not afford our heritage like Ghalib to fade away in the oblivion. I read Ghalib first as engineering student, like all young people used to in those days of early 90s. Reading Urdu poetry and falling in love was essential part of growing up those days. While poets like Sahir, Faiz and Daagh also stayed with me for long time, but Sahir and other poets were like the loving worshiper of Urdu, Ghalib was like one of the Gods of Urdu poetry. The sense of being ancient, the mysticism of poetry and the man himself and his life, gave him this stature to my young mind. Ghalib, Mirza Asadullah Beg Khan was born on 27th of December, 1797 in Agra. Most genius minds are plagued with there own insecurities and uncertainties of their own talent. Ghalib was very unlike them. He was at all times, very much aware of his own station in life. Although most of his life, he spent chasing the government, earlier, Mughals and later, the British for what he believed was his dues, mostly on account his martial and aristocratic heritage, he was very much conscious of his literary and philosophical position.He presumed his literary excellence to hold in British view as venerable a position as it was to the Mughal courts. However, Mughal sultanate was on a decline and the Emperor himself was a pensioner. In 1805, Mughal scion Akbar Shah II was committed a pension of INR 15,00,000 later; the Company-Bahadur however, rescinded and reduced it to 12,00,000. The protests made by the Emperor to the court of director, did not yield any result. If such was the state of the patrons, what would happen to the court? If the emperor was to face such a fate, what would be the fate of the plea of the court-poet of a fading language in a fading empire, is anybody's imagination. His father, a soldier, came to India in search of employment during the time of Mughal King Shah Aalam II, almost around the time when British obtained the decree for collection of taxes, still ostensibly under the Empire of Mughals or the pretense of it. He worked with the king of Alwar, Nawaab of Lucknow and eventually settled in Agra. 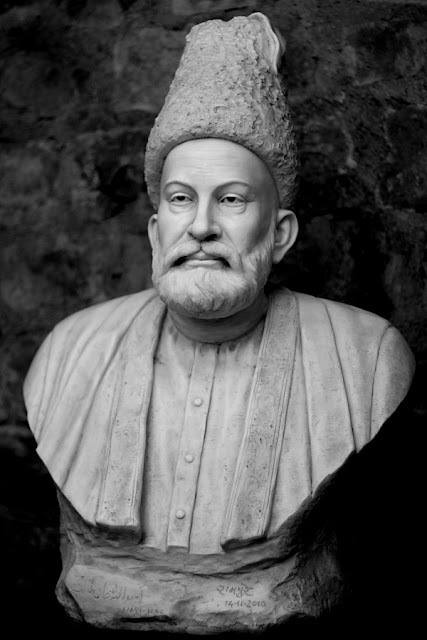 Ghalib, however, was orphaned at a young age of five. He started writing by the age of Eight, legendary talent that he was. His biographer, Hali writes that someone called Kanhaiyyalal had preserved a Masnavi (collection of 6 books) he wrote at the age of Nine. He initially was charmed by Persian and wrote in Persian, considering it chaste and purer language than Urdu. He was a prolific writer. Hali writes that Ghalib often composed while drinking in the evening. Sitting alone, his fingers playing with a long sash, he would tie a knot, whenever he finished a verse. In the morning, he would untie the knots, recall the verses and write them down. He married at the age of 13 to Umrao Begam, a fanatically religious and pious woman, for a long life of companionship. Ghalib's sharp intellect stood at odds with religious dogmas and caused very interesting interaction between the husband and wife. Ghalib writes in a letter to friend Mirza Tufta, while expressing his inability to write introduction to a friend's collection of poem- "God has exempted me from Namaz and Roza (Fasting during Ramzaan), can't you exempt me of writing a Preface." He writes to his friend, that the emperor laughed at his quick wit and plain-speak. However, when he eventually moved to Delhi for prospects and recognition in Mughal courts, he began writing in Urdu. Bahadur Shah Zafar was Mughal Emperor and the anti-British revolt of 1857 was yet to happen. The emperor already had Zauq as his Ustaad or master of literature. His was the fate of any talented migrant. The talented poet had no one to vouch for him, no support system in the largely disinterested and highly networked city, going through the period of political turmoil. The Emperor did not acknowledge Ghalib till 1850 when he was eventually offered the title of Nazmud-daula, Daabir ul-mulk, Nizam Jung (Star of the Realm, Scribe of the state, Marshal of war). Mughal Emperor was by then the ruler for namesake, while the real political power rested with the Governor-General. Ghalib had an acute appreciation of his own aristocratic lineage and his own genius, which made the royal ignore even more unbearable. He was not sparing even to himself. (You ask on every question, who are you? Ghalib was told many times that his writings were quite complex and he should dilute his writing to make the comprehension easier. He refused to do so famously writing,"
If there isn't any meaning in my verse, let there not be." An irreverent, audacious poet who refuses to bend down to commercial demands, but that is not all that is there to Ghalib. His deep intellectualism, Sufism in his verses, makes him some kind of visionary, a saint in his own right. We would have considered you a saint, had you not been a drunkard). He was not aloof and disinterested in getting his work read. He eventually started writing in Urdu publishing his first Urdu Diwan (Collection of poems) in 1821. Before publishing this, Ghalib did edit his work with a vengeance at the advise of Fazl-e-haq, discarding around two-third of all he had written. In a letter, he even confessed in his old age that most of his writing during the age of 15 to 25 was rubbish. He then torn off the Diwan, retaining merely 15 -20 of the verses. In 1828, he published a combined selection of Urdu and Persian verses- Gul-i-Rana. His Urdu Diwan was published in 1841 and sold out. It was republished in 1847. His collection of Persian verse was published in 1845. In his private life, he was always in debt, and lost all his children. His brother died in the aftermath of 1857, when the whole city of Delhi was destroyed. Ghalib lived to see the city limping to life, but never regaining its earlier glory, before finally departing on 15th February 1869. He wrote his last Urdu verse in 1866 and last Persian ghazal in 1865. Before his death he saw the whole way of living as he knew it crumbling in the face of strong winds of change, with Quila-e-Mualla (The red fort) converted to barracks, Mughal emperor exiled to Rangoon. 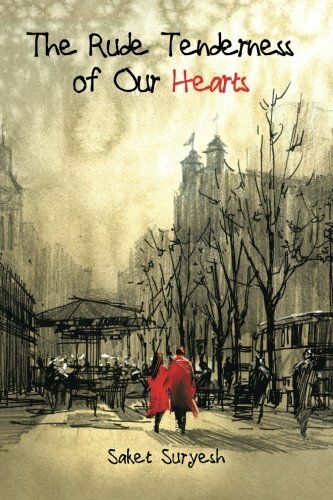 The world of literature and poetry and art, gave way to the sounds of marching soldiers on the streets of Delhi. Ghalib, who counted Raja Bansidhar, Mushi Hargopal Tufta among his friends and was so secular in his views, would have also seen with some sadness the changes, as beef ban imposed by the Mughals being lifted by the British with little understanding of India, triggering first communal riot in modern times. His wife died exactly one year after him. (I hope you will enjoy reading my posts on Ghalib's poetry. I invite you to join me in this reverential homage to one of the greatest poets we have had in recent times).